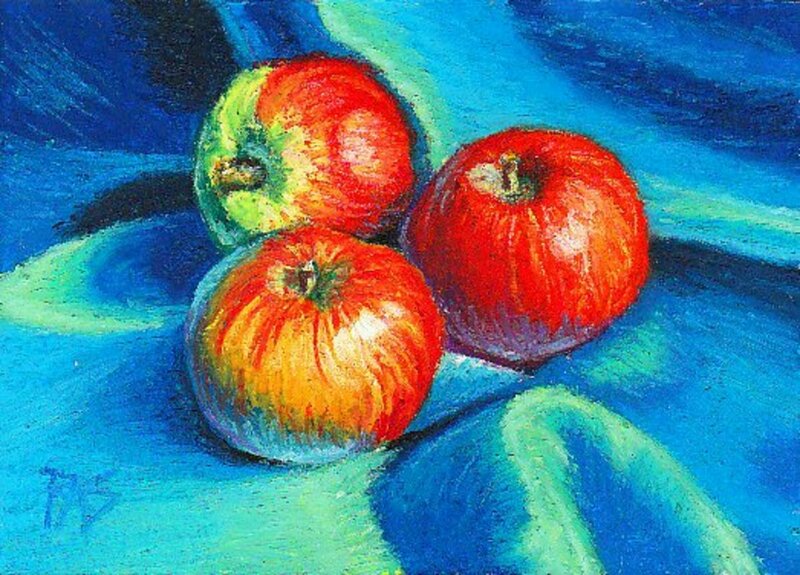 Apples in Blue Silk by Robert A. Sloan using Erengi Art Aspirer oil pastels on watercolor paper primed with Colourfix clear sanded pastel primer. I first ran into oil pastels when I was a teenager. I was buying something else and saw these boxes of colorful sticks at ludicrously low prices in a dimestore. They might have been Pentel or Loew-Cornell. I picked them up on a whim while getting school supplies because I often did sketching with stuff I got for cheap. It seemed like they couldn't be good art supplies because even the biggest range was only a dollar or two and change. I'd also never heard of oil pastel paintings even in contemporary art museums. They were obscure. I tried them and wow -- unlike crayons, these sticks were opaque! They blended well, they had great color ranges including plenty of useful earth tones and neutrals, most of all the light colors often covered the darks completely so I had a wonderful freedom of expression with them. 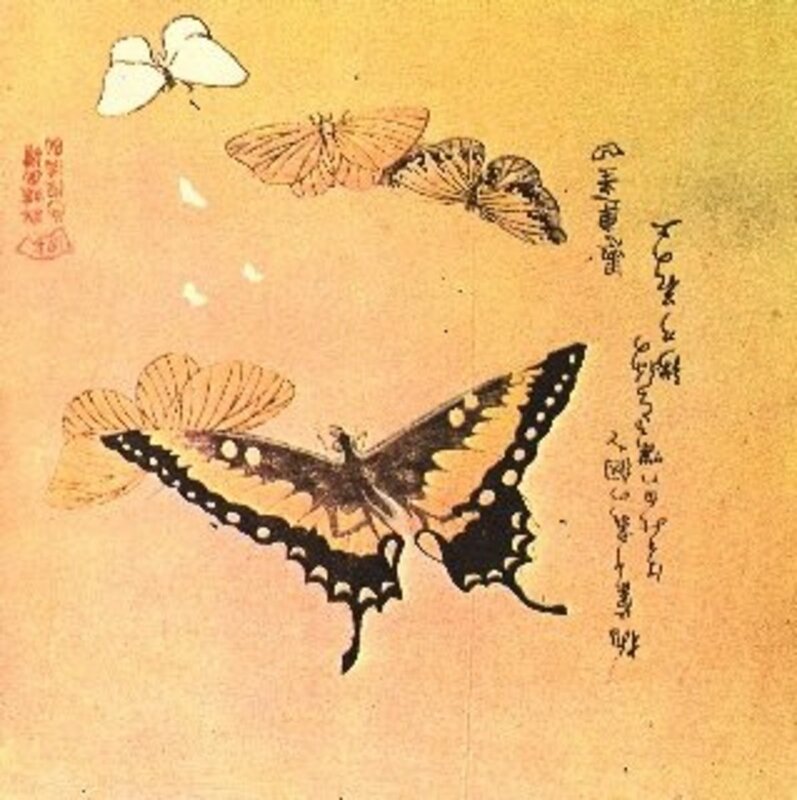 Soft pastel paintings have a long history. Oil pastels are new. Invented in the 20th century, the first oil pastels were made by Sakura Cray-Pas -- the brand that when I saw them again in the art store cost a little more than the dimestore set I first noticed. Sakura now makes three lines of oil pastels -- Cray-Pas Junior, an excellent children's product and good inexpensive sketching set, Cray-Pas Expressionist, moderate priced student grade oil pastels (the round sticks) and Cray-Pas Specialist in 88 color range -- the artist grade product with archival lightfastness and strong pigment saturation. There are not many brands of artist grade oil pastels available. The first was Sennelier oil pastels, created by Henri Sennelier for Henri Goetz and Pablo Picasso in 1949. Picasso wanted a fine art medium that he could use on any surface -- corrugated cardboard, found objects, glass, metal, wood. All oil pastels seem to have this quality today and the Senneliers are the softest oil pastels available. Senneliers have a texture like painting with women's lipstick. This can be fun and it's closer to painting directly with oils than any other brand because they're so slippery and loose. Artists used to the firmer brands may find Senneliers a little hard to control. They vary in transparency from near transparent to strongly opaque and have many unusual grays that Picasso loved. Definitely an artist's palette with many pigment choices close to the same hue that vary in opacity, toxicity and mixing. Loads of primaries that each mix differently. Senneliers will go over any other oil pastels even if the surface is completely saturated. I use mine as a finishing layer. Senneliers have a 120 color range including an iridescent white that I love. Holbein took a different approach to artist grade oil pastels -- they modeled their 225 color range after soft pastels. Every hue has tints. The 225 range has four tints for each hue, but they are discontinuing the 2 and 4 tints so the full range will only be 141 with more value ranges in the grays. Holbeins are nearly as soft as Senneliers but very opaque. Most colors have artist grade lightfastness, a few of the tints don't but Holbein's site lists the ones that have potential fading issues. These are available in open stock or cardboard or wood box sets. They are the most expensive but they are so rich they're worth it -- and still only comparable in price to artist grade soft pastels. Caran d'Ache Neopastel oil pastels are artist grade and unlike the Senneliers or Holbeins, they are all nontoxic. (So are the square-stick Cray-Pas Specialists). I love their soft firm texture, extreme pigment saturation and wonderful mixing. The 96 color range is well balanced and yet I was able to get any hue I wanted mixing the well chosen sticks in the 12 color set that I started with. I've since upgraded to a 48 color set and plan to buy the full range since I like these best of all. Erengi Art Aspirer oil pastels, available from Jerry's Artarama or ASW Express online or Jerry's stores in person, are also artist grade and a super bargain especially when they're on sale. I bought a 50 color set on sale to test them and then got the 92 color full range wood box. They are similar to Neopastels but more firm, the color range is great, and they are my on the go set because the wood box with its metal lined foam-padded trays is so durable and small. It's easy to grab. Last of the definitely artist grade oil pastels I know of currently is Cretacolor's watersoluble Aqua Stic. These are firm, about comparable to the Cray-Pas specialists in texture, long thin round wrapped sticks with a tapered point. They're lightfast and convenient. I bought the big 80 color set to have a full range of tints and found them great both wet and dry -- I can do my underpainting with the sticks, wash it to turn it into the underpainting and keep going with any oil pastels I want over that. 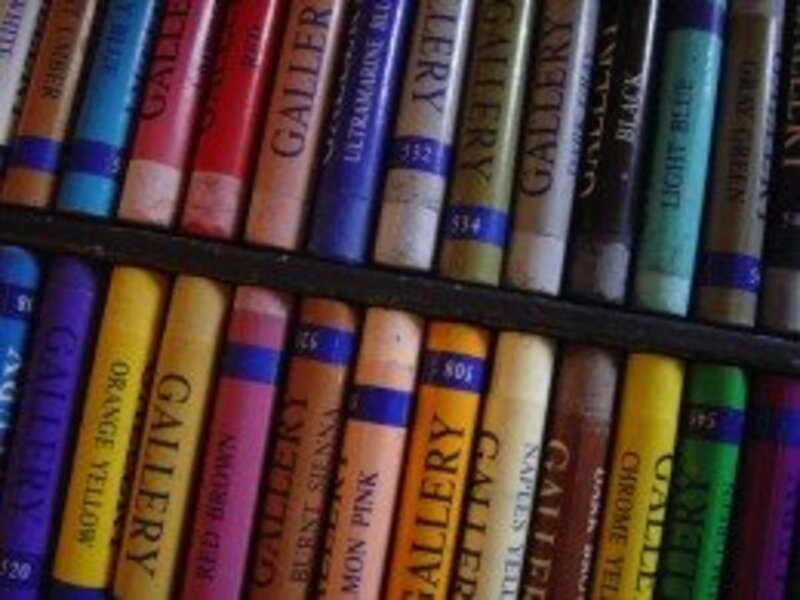 With these artist grade oil pastels, I have seen some incredible paintings by members of the <a href="http://www.oilpastelsociety.com">Oil Pastel Society,</a> which I joined as an Associate member. This fine art society has only been in existence for a few years. I feel as if I'm in the early stages of a new movement in fine art rediscovering oil pastels, just like the transition colored pencils made from an illustrator's and designer's medium to a fine art medium in the 70s and 80s with Bet Borgeson and Gary Greene. Some of these artists are producing spectacular realism. Others are doing glorious Impressionism and other styles. While most of the examples shown to sell the products are jazzy loose modern art like the Picasso on the cover of the Senneliers, oil pastels can actually do just about anything you want them to. 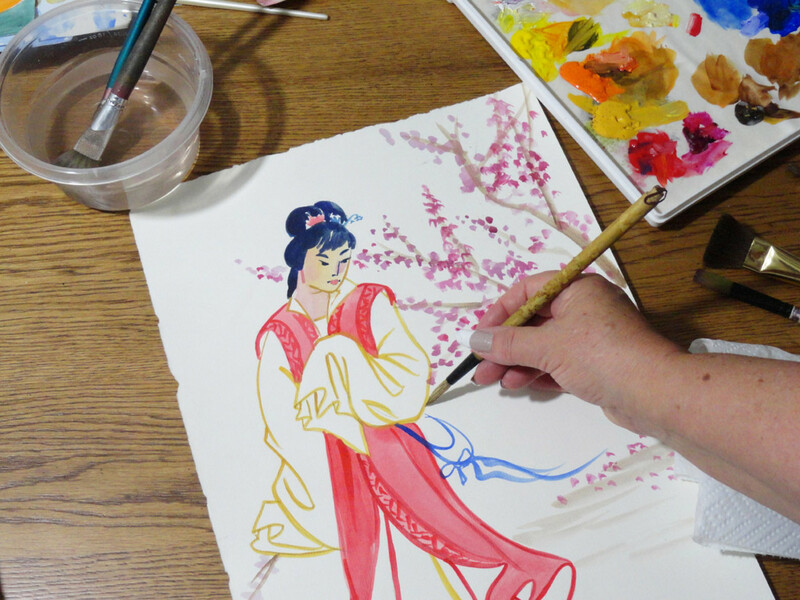 Like colored pencils, you can either do paintings or drawings depending on whether you want to work loose and make the ground part of your rendering or whether you cover it with painterly strokes. One step farther though -- the wet effects with oil pastels are much more like oil painting in a thinner-wash vein, and you can paint with them directly. With the Aqua Stic ones, they can be used like traditional pan watercolor by dragging the brush across the end of the stick and painting as you ordinarily would, with the others you need to use odorless turpentine or linseed oil or other oil painting mediums to get that painting effect. The range of styles and types of art that can be created with these is limitless. You can do anything you want. I'm only beginning to discover what my good oil pastels can do -- but if you've been disappointed with them in the past, try some artist grade ones. Limitations from the supplies can turn someone off from a medium and give an impression it's your skill that's lacking. That's true for any art materials but especially so with oil pastels since the cheap sticks are waxier and more like children's crayons. Cheap sticks vary a lot more in texture and coverage, crumbliness and blendability. Some have wonderful handling qualities and seem as if they ought to be fine art grade but aren't available in open stock and might not be lightfast. Others are like kid crayons and can be very frustrating. They have their uses though. I have been reviewing every brand I can get hold of including all the cheap student grade ones on my oil pastels website, <a href="http://www.explore-oil-pastels-with-robert-sloan.com">Explore-Oil-Pastels-With-Robert-Sloan.com</a> since I could not find reviews on them anywhere or even a website totally devoted to them -- some articles on pastel websites and general art websites were useful but the only all oil pastels site was the OIl Pastels Society one. So I joined and now write for the OPS newsletter, the Oil Spiel. Starting this April, I will be purchasing some Blue Wool cards and with the help of a friend, doing a series of independent lightfastness tests on all the oil pastels I have available. There hasn't been a comprehensive independent test to my knowledge. There is no ASTM standard for lightfastness for oil pastels, so it's important to test yours for yourself to identify which sticks are the most durable and which ones no matter how useful the color, need special treatment and care to survive in a fine art painting. Then again, the ASTM didn't have standards for colored pencils till very recently and colored pencils have been a respectable fine art medium for decades. Like I said, I feel as if I'm in at the start of a bold new movement in fine art and helping establish a wonderful and too often ignored fine art medium. Two excellent books exist for learning how to use oil pastels. One is Oil Pastel for the Serious Beginner by John Elliot. This is the first one I got and it is excellent. Elliot does have some realism pieces as well as loose jazzy ones and covers a wide variety of techniques and applications with depth reviews on the brands I've mentioned and some I couldn't find. His focus is on the fine art uses of oil pastels. The other, cherished by all the oil pastelists I know and now out of print but often available used on Amazon, is Oil Pastel, Materials and Techniques for Today's Artist by Kenneth Leslie. There are some rumors that the author may update it and come out with a new edition. I do hope so because some products now available weren't in existence for him to try, like the Cretacolor Aqua Stic artist grade watersolubles. This book goes into much more depth than the Elliott book and covers different aspects. I recommend getting both, but if you only get one, this is the one to get as it's encyclopedic. There are some relevant pastel books too. The Pastel Book by Bill Creevy has a good section on oil pastels and I think there's more on them in his oil painting book. 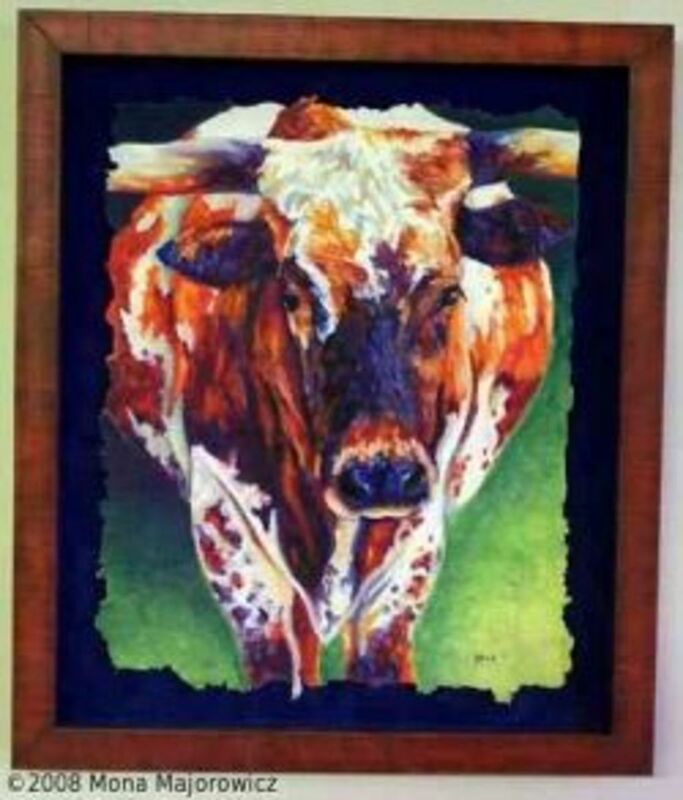 Walter Foster has one title available on oil pastels and at least one other that includes them -- Wildlife in Oil Pastel, Acrylic and Oils. I ordered both but they haven't arrived yet. As other books become available or I find them, I'll add them to this list. Meanwhile, many soft pastels and oil painting books have useful techniques and ideas. I noticed the Amazon capsule brought up a pastels book I just bought -- Capturing Radiant Light and Color in Oils and Pastels by Susan Sarbach. You might want to get that too. Oil pastels have some qualities of both, many pastelists who develop dust allergies shift over successfully to using artist grade oil pastels with no loss of power or color. Since the Colourist method of painting can be done in either oils or pastels, adapting it to oil pastels takes only a little trial and error before you start producing glorious color-saturated works. I took a class online with Charlene Herczfeld, who studied in person with Susan Sarbach and has a strong Colourist style -- and have seen her beautiful oil pastel paintings. The main thing to remember in doing Colourist paintings with oil pastels is that oil pastels are not as totally opaque as soft pastels or thick from the tube oil paint, so if you want white or very light highlights to be strong, put a layer of them under where you want the highlight to scrape back to it before reapplying the highlight. You can also join and visit <a href="http://www.wetcanvas.com">WetCanvas.com</a> to find a thriving Oil Pastels section in the forums where many successful professionals share instruction and help beginners. I'm very active over there and that's some of how I drifted into oil pastels this time. Bottle, Quartz, Aquamarine -- Pentel can get detail! 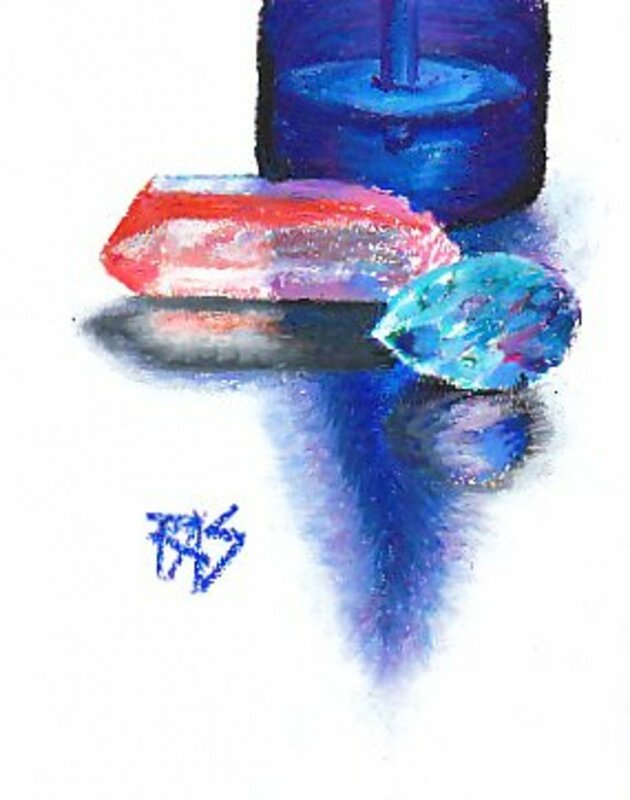 Bottle, Quartz, Aquamarine in Pentel oil pastels on sketchbook paper by Robert A. Sloan -- great detail and luminosity can be done even with inexpensive oil pastels! Cheap is good for studies and sketching! Sometimes lightfastness isn't an issue. Art that winds up inside your sketchbook where you only look at it occasionally and store it in the dark with the covers closed can survive even if the materials are extremely fugitive -- like all fluorescent colors in any art supplies. The pretty glow of a fluorescent color is the pigment degrading and emitting light when UV light hits it. Of all the many cheap brands I tested and reviewed on my site, Pentel is the one that gives me the most control and opacity. The tiny little sticks last a good long time and hold their shape to get into small details and the colors blend as well as the Neopastels, so that became my favorite sketch set. Your mileage may vary. Since I got the 50 color set for $5 and change, you might as well try it if you are used to colored pencils and mediums you have some control on -- it's a good quality and amazing quality for its price. Loew-Cornell, common in every art store and many drugstores, is also pretty good. Watch out for the crumbs that fly off with heavy pressure. They need to be blown away, not brushed away, or carefully pressed in with a blending tool back into their respective color areas. Otherwise they smear -- they are very sticky crumbs. Some brands are more prone to this than others. I thought of the crumbles as part of the texture of oil pastels in general but not all brands have as much of a problem with it as others. Some of the artist grade ones barely crumble at all and if they do, are very easy to blend back in even using the stick. That technique is a new one for me but it's been pretty effective lately. It takes some patience if I'm using crumbly ones though. Back in the day, when I was a street artist in New Orleans, I picked up a set of oil pastels and some canvas boards. I decided I was going to fool around with doing some real oil paintings super cheap -- it was pocket change for small canvas boards and a buck and change for the oil pastels so I was kitted up on a whim that day with what I had in my pocket. I bought a small bottle of turpentine and a bristle brush and I was off. The results were exactly like any oil studies done with lots of turpentine. I scribbled out a palette on a paper plate with each of the colors I wanted to use, got the brush soaking, stirred it into paint and started washing. They were indeed Real Oil Paintings and my buyers got full value for their five dollars. Not exactly high grade artist quality oils but actual oils anyway! Then I got into the oil pastel forums at <a href="http://www.wetcanvas.com">WetCanvas</a> and started seeing some of the incredible art others in there were doing. So I began to invest in some serious professional supplies with a 12 color set of Caran d'Ache Neopastels. I did one of the challenge photo references with only that 12 color set and love the results -- they are even subtler and richer in real life, the painting sold off my blog while it was in progress. Water Lily Pond by Robert A. Sloan, Caran d'Ache Neopastel on Rich Beige Colourfix sanded pastel paper. 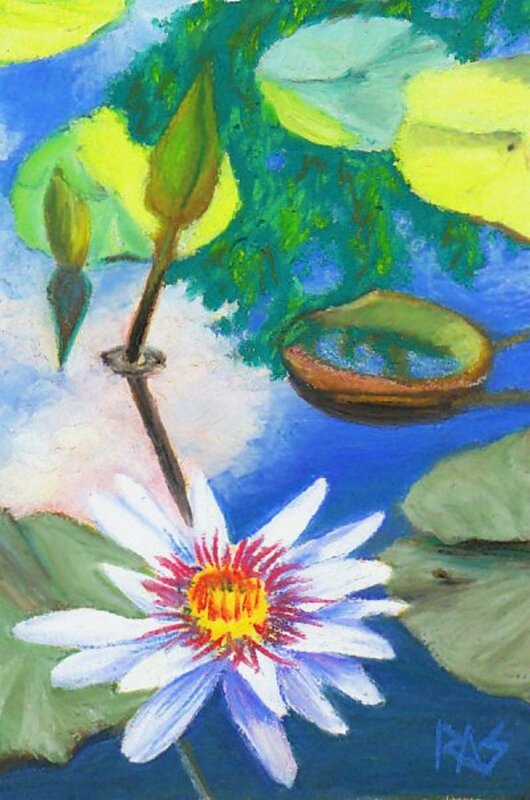 Up till I did Water Lily Pond, I didn't expect subtle detail in an oil pastel painting. I thought of it as a good medium for working large the way I do soft pastels -- something that finishes fast and has a big range of colors to choose from rather than something I could slow down and layer like colored pencils. I hadn't tried Colourfix sanded pastel paper with oil pastels yet though. The grain on the sanded paper is very fine so it lets me get small details well, but it holds enough layers for five or six color mixtures to come out with exact muted blue-greens in the foreground water or good muted greens in the leaves. I loved how this one came out and it sent me deeper and deeper into exploring oil pastels. They've become my favorite medium and now I even manage to do some ACEOs with them, little trading cards only 2 1/2" x 3 1/2" -- but I find I am drawn to doing more pieces in slightly larger formats because it is true that I can finish something 5 x 7" or 8 x 10" or something like that a lot faster than in colored pencils realism. I've also drifted toward impressionism and a Colourist approach as with my three apples in blue silk that I put at the top of this article. 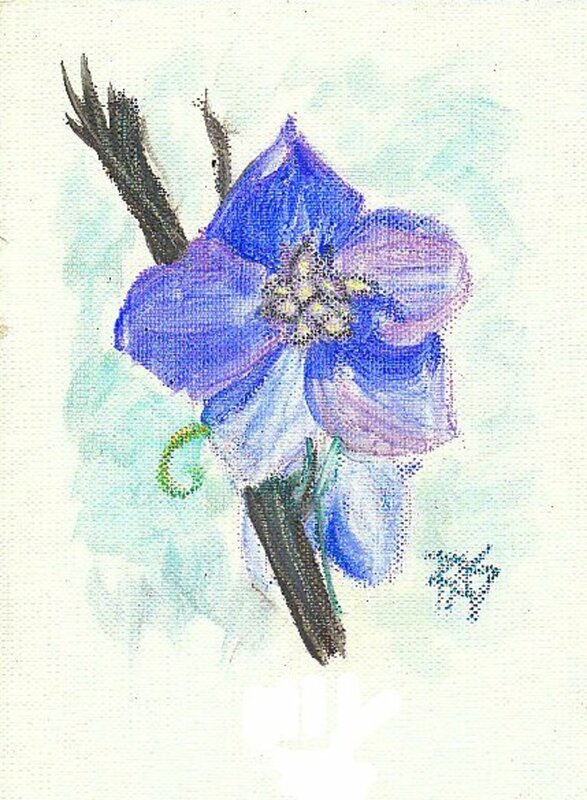 I'll end with a turpentine wash sketch of a blue delphinium that I did last night -- my latest go at the old Real Oil Paintings gig, done now as its own medium on canva-paper for early stages. It works well for underpainting too -- though if you use any oil mediums with oil pastels you need to use a primed surface suitable for using oils on. Oil pastels are made with mineral oils that never completely dry, so paintings done with them should be framed with glass like soft pastels. Dust will ruin them and can't be removed. Oil and acrylic paintings can literally be washed and the varnish removed without hurting the paint layer. Watercolors, oil pastels, colored pencils and so on can't be varnished with a removable varnish without the art coming off with the solvent, so be sure to frame your oil pastels art with glass. I hope this overview has interested you in my favorite new medium -- you can set up for cheap, see if you like the feel or jump right in with artist grade pastels and good archival supports. They do stick to just about anything and that makes them a joy! I love oil pastels. Your artwork is very nice. I think you have some great content here that makes for great reading! Thanks for this hub, I found it useful and interesting and I liked your work. I like your work. I have worked with oil and chalk pastels in addition to oil and acrylic paints. I like pastels because there is a dimension of control similar to drawing, yet the colors allow painterly strokes and innuendo in the work. I love working in oil pastels myself. Sennelier are my very favorite; they are amazing. I love doing art anywhere, and oil pastels allow me to do this. Great article, great art! Thanks for all of the details about pastels. I have a box of oil pastels rolling around in my art drawer for years. I will give them another try one of these days since reading your article. It was informative... and I too painted some apples and wrote about it on my website. Fun to meet another artist! Wow - Those apples are beautiful. You are so talented! Love this media; great hub. I visited the page, read the article, disagreed and posted an opposing opinion as a comment. You may or may not remove the comment, but it's not a flame, it's a disagreement. I've been in too many bad situations where someone saying "Smile" is saying "Shut up and don't tell me things like that happen to people who don't deserve it." Most of the trouble in the world happens to people who don't deserve it and sometimes the scum rises to the top. That doesn't mean to give up. It just means to feel what you feel, think what you think, connect with what's real and not go digging into denial to hang on to bad situations, whether that's a workplace, personal relationship, health or financial trouble. Great artwork, very informative. Check this out..
Hope you like it. Plez recommend. Thanx. Thank you, Rose! I'm currently in the middle of my spring cleaning, which is going to turn into a weeks-long deep sorting of all my books and art supplies as if I just moved in here. Actually that process deserves its own Hub, it might be an amusing story! Pam, thank you! Yes, you should try them. It's so cheap that when I was down in New Orleans I felt secure -- knowing I could get a portraits medium going with just pocket change if my building burnt down was some real security. These are so beautiful, Robert. My mother loved oil pastels and used them, but I haven't tried anything since like this since high school. Reading your hub made me want to give it another shot. Your work is so vivid and soothing. You really are excellent at what you do. Thank you. Awesome Robert!!! I can't wait to read in more detail. How are you doing?